Start with a knack for anagrams. Multiply that by a way with numbers. Subtract from the result any morning or late-night fuzzyheadedness. 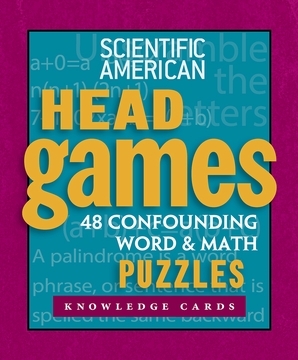 You now know your HGQ, or Head Games Quotient—we invite you to apply it to the 48 puzzles in this Knowledge Card deck. Palindromes, shared snacks, travel at uniform velocity—such are the ingredients of conundrums that will give you a mental workout to keep your brain humming away all day long. Did you cut your teeth on crossword puzzles? Do you sprint blithely through a set of sudoku puzzles? Can you rearrange the letters in “eleven plus two” to produce a different, but equal, addition problem? Step up to Head Games.